Once upon a time, The Dingo heard a loud commotion outside his home. So he ran outside to investigate. As he walked across his yard to the sidewalk, he could see a crowd gathered in the middle of the road and a lot of yelling going on. “You shouldn’t of been speeding!” yelled Mrs. Bear. “Well, your kid shouldn’t of been running out into the middle of the road!” yelled Mr. Gus. Thankfully, little Lucky Bear was unharmed in the incident. 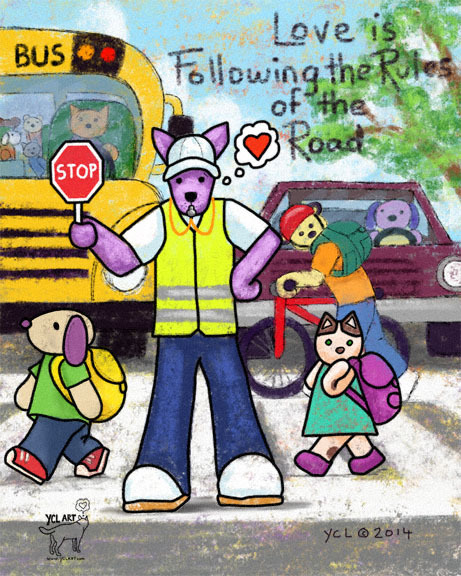 It seems that on his walk home from school, Lucky Bear decided not to cross the street where the crossing guard was stationed and instead decided to break the rules of the road and cross where he wanted. To make things worse, Mr. Gus was also breaking the rules of the road. He was running late for an appointment so he was driving way faster than the posted speed limit. Luckily, for both of them, he noticed the little guy in enough time to come to a screeching halt barely avoiding an accident. Neighbors, along with Mrs. Bear, who had seen the incident were gathered around to make sure Lucky Bear was okay. As the bickering continued over who’s fault it was, The Dingo decided to interject: “We ALL need to learn and obey the rules of the road. It doesn’t matter if we are walking or driving or young or old. Mistakes will happen because no one is perfect and the rules are made to protect everyone.” The crowd nodded in agreement as The Dingo spoke. Both Lucky Bear and Mr. Gus broke the rules and someone could of gotten very hurt. They both apologized and both promised to do a better job of following the rules of the road. The Dingo knew that while many were aware of the rules, many were not. He decided to invite everyone, children and adults alike, for a potluck dinner the next day in order to help raise awareness regarding the rules of the road to make the streets in their town safer. He contacted his local city government & arranged to get some informational brochures regarding the rules of the road. He handed those out to everyone in attendance. Many topics were covered during the gathering including: sharing the road, pedestrian & bicycle safety, and defensive driving techniques, just to name a few. It was a lot of work but The Dingo knows that following the rules of the road is very important and it can save someone’s life. This is just another way for people to walk in love towards each other and he is more than happy to help anyway he can. The Dingo Walks in Love is a project that teaches lesson in love with the power of art, social media, books, pubic art, & random acts of kindness.